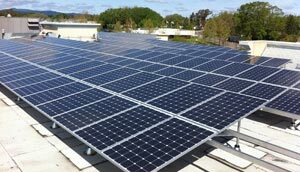 Roof mounts are the most popular installation for solar companies in Sonoma County for a reason. They are less expensive, utilize previously unused space and are elevated to mitigate shading effects. Different roof types require different attachment methods. Westcoast uses a combination of proprietary attachment points and roofing industry best practices to ensure that your roof doesn’t fail or leak. Through years of experience, Westcoast’s solar professionals know when a roof will require a professional roofer to ensure a long life. This method may cost more initially, however, this cost is usually negligible when compared to the future cost of major roof repairs. When you choose Westcoast you are making the choice for long-term value. A WSE specialty is large residential ground mounts. Their investment in specialty equipment enables even the most complicated installations to be completed flawlessly, on time and on budget. Unique in the marketplace as the only solar company to self-perform every aspect of a project with company-owned equipment. The standard industry practice is to rent the minimal equipment necessary or rely on a patchwork of subcontractors and non-skilled laborers to complete a project. This practice makes it impossible to deliver the consistent quality Westcoast Solar Energy is committed to. Westcoast Solar Energy owns their own excavation equipment. Crews show up trained to handle most underground conditions as they occur. Boulders, hard-pan, cobble and steep hillsides often send lesser companies back to the rental yard for more equipment with extra charges to the customer. In the long run, this strategy has proven to actually cost less than the typical subcontractor/ laborer model an example of how Westcoast creates advantages for their customers and applies that advantage to providing higher quality solar equipment. This is a very common term in solar construction and project development. However, if you asked for a definition you would get a diverse array of answers. To most, value engineering means lowest initial equipment cost. WSE values a solar array differently. Sure, a low initial cost is one of the drivers, but the true value is achieved in the lowest combined cost of ownership. The true cost then is the initial cost plus the cost to operate and maintain the system over the useful life of the array. One item that gets overlooked is the initial cost being subsidized by tax incentives. Sometimes up to 66% of the initial cost is returned to the original purchaser, while repairs or replacing failed equipment is not incentivized. Add to this any costs associated with financing and lost generation and the lowest initial cost can easily become the most expensive solar array to operate. WSE’s definition of value engineering is… applying cost advantages from efficiencies and smart design to superior reputable equipment, materials and quality workmanship allowing for a longer, trouble-free investment. In summary, Westcoast Solar Energy customers experience the lowest true cost in the business. Over the years solar PV technology has changed greatly and Westcoast has successfully navigated this ever-changing landscape by sticking to a basic design credo: Use proven technology from reputable manufacturers and installing properly using advanced tools. WSE is not quick to jump on the latest bandwagon or deviate from their tried and true design credo. Simply stated, Westcoast Solar Energy will not allow their customers to become product testers for the latest whiz-bang solar gadget.